How did I miss this book when I was five? I would have loved it above all others. 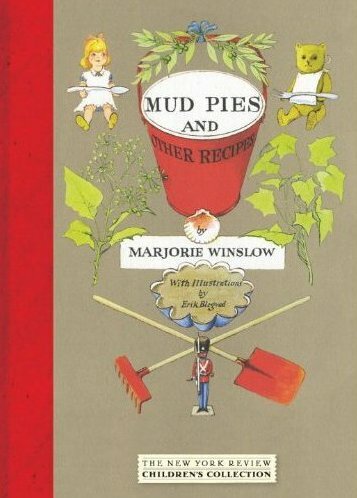 Mud Pies and Other Recipes by Marjorie Winslow is a make-believe cookbook. 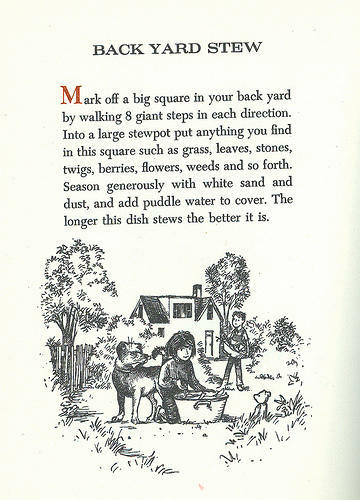 It’s earnest, packed with back garden cooking tips and thoroughly charming. Whether your children are hosting a doll’s tea party, entertaining fairies or catering a teddy bear’s picnic, this cookbook is brimming with recipes to inspire imagination and fill many happy hours outdoors. “Doll cookery is not a very exacting art. The time it takes to cook a casserole depends upon how long your dolls are able to sit at a table without falling over”. and “…if a recipe calls for a cupful of something, you can use a measuring cup or a teacup or a buttercup. It doesn’t much matter. What does matter is that you select the best ingredients available, set a fine table, and serve with style”. According to Winslow, thousand dollar play kitchens are not necessary at all – “The sea makes a nice sink; so does a puddle at the end of a hose. For a stove there is the sun, or a flat stone. And ovens are everywhere. You’ll find them under bushes, in sandboxes or behind trees”. 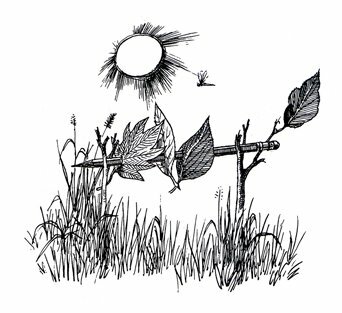 I love how seriously Winslow treats the topic, I love Erik Blegvad’s sweet engravings and I love how this book will have kids tearing into the backyard to get to work. Truly a book to treasure. Mud Pies and Other Recipes is available from Book Depository for $16.76. Book Depository delivers free to Australia.